I’m about to mount a soapbox here, just warning you. The last two days were immersion for me into the world of bees. Friday I drove back up to Gilsum, New Hampshire to NH Honey Bee. I returned my empty honey bottle from my most recent trip, bought 3 more jars and equipment for my bee-keeping class on Saturday. John just laughed shyly and said, “There is plenty to go around for everyone.” Not the standard business banter I have known in corporate America. He also mentioned he had lost 20 hives over the winter to bears. Each mature hive produces 60 to 90 pounds of honey a year so at roughly $12 a pound, he is looking at an estimated loss of $1,800. But I had to figure the math out for myself as he was more focused on the loss of his bees. A bigger threat to the balance of nature than bears (and no, it isn’t the honey they are after, that’s the hot fudge on the larva they seek) is pesticides. Think major companies here like Monsanto, Archer Daniels Midland, Bayer in Germany and Sygenta of Switzerland. Seeds are coated with the chemicals to protect the plants from “pests”. Europe voted to ban the substances earlier this year. The treated seeds, of which corn is a major one, mature into plants that carry the chemical all the way up and through the flowers. Bees collecting pollen or nectar from the treated plants suffer a neural disorder that disorients them so they can’t return to their hive or they lose the instinct to leave the hive. It is known as “Colony Collapse Disorder”. The really stupid twist to this is if no one pollinates the crops, there won’t be any fruits, vegetables or flowers. So when I think of John’s comment about competition in business, I can’t help but become enraged with “Big Business/Government” for allowing this to happen in the name of profit. 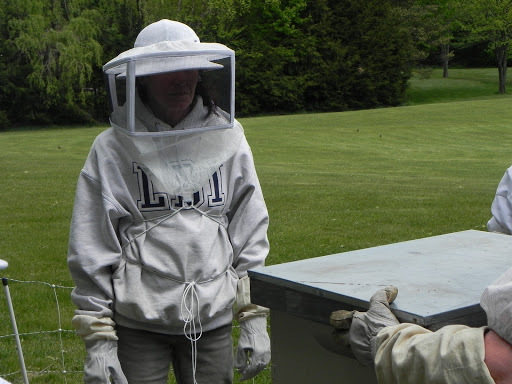 This entry was posted in beekeeping, bees. Tagged Archer Daniels Midland, Bayer, Bee Tree Farm, Colony Collapse Disorder, Monsanto, NH Honey Bee, Sygenta.